From my last visit to my spot in Centennial Woods in early February, more phenological changes have occurred. Similar to last time, there is some snow, although this time it is super fluffy, and only half an inch deep. Through this snow, the earth is soft and muddy. The tracks left before me, both by people and their dogs, were brown and filled with water. 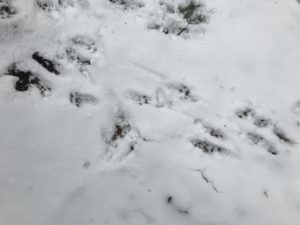 My boots left hard, white tracks, as they pressed deep into the soggy soil. 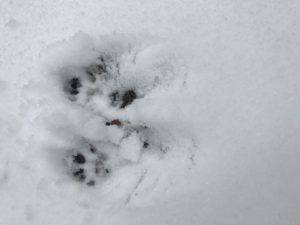 Due to the snow, this was the only bit of the ground I really saw, and based on my location in the woods, the only water I saw was in those tracks. Luckily, the tracks left by animals on my site were easy to identify, due to the freshness and fluffiness of the soil. By far the most abundant were red squirrel tracks, pictured above. They were on logs, leading to and from the large Eastern White Pine, and all across the ground. The most noticeable change was that of the birds. As soon as I entered the woods, I could hear all different bird songs, something I hadn’t really heard in months. This was a very exciting sign to me because it does signal that spring is, in fact, coming, and I cannot wait for warmer weather. 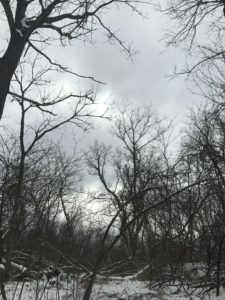 Determining the natural community of my location in Centennial Woods was a task that I initially found to be quite daunting. In Vermont, there are six natural communities, ranging from Montane Spruce-Fir Forests to Northern Hardwoods, and more. My site has a lot of hardwoods, so I pretty easily narrowed it down to being Montane Yellow Birch Red Spruce Fir forest, Spruce Fir Northern Hardwood, or Northern Hardwood. My site does not have any birches present, really only has Eastern White Pines as far as coniferous trees go, and is not at an elevation of 25,000 feet or more, which pretty much means that it is a Northern Hardwood Forest. This option definitely makes the most sense because the sugar maple is the most common tree in my site, there are two large Eastern White Pines present, there are both red and white oaks along the backside of my spot, the soil is pretty well-drained, ferns are present, and I have seen chipmunks and squirrels while there, which are all telltale signs of a Northern Hardwood forest. When I used BioFinder, I discovered a lot about both my specific area, and Centennial Woods as a whole. In regards to my approximate location in Centennial Woods, I learned that it is a representative physical landscape, a priority interior forest block, and the highest priority landscape. It is also directly next to/upland from the creek that runs through Centennial Woods, where all of the land surrounding the creek are class 2 wetlands, connectivity for riparian wildlife, and highest priority surface water and riparian areas.